Lee Freeman Hersch (1896-1953) was born 5 September 1896 in Cleveland, Ohio. He was a painter in realist and abstract styles. He died in Madrid, Spain, in 1953. Hersch attended the University of Cincinnati and spent the winter of 1917-1918 in Taos, New Mexico, where he painted scenes with Indians of the Taos Pueblo. His Taos paintings established his reputation as an outstanding artist. His formal artistic training included classes with Henry Keller, Kenyon Cox and Douglas Volk at the Cleveland School of Art and the National Academy of Design. Hersch enlisted in August 1918 and served with the American Expeditionary Forces in France from 28 October 1918 to 11 July 1919. He was honorably discharged a week later. This was his first time overseas and was the start of extensive travels. In 1920, at age 24, he left the U.S. to return to Europe. On his passport application, he said he planned to visit and paint France, Italy, Spain, England, Holland, Belgium, Switzerland, Morocco and Algeria. Hersch had not been long in Paris when he met American novelist Helen Virginia Davis (1896-1978). They married on 21 April 1921. For some years thereafter their joint studio on the Left Bank was a popular gathering-place for painters, writers, and other intellectuals. They became close friends of Mexican artist Ángel Zárraga (1886-1946) who had moved to Paris in 1911 to live there permanently. As a gift, Zárraga painted a portrait of “Miss Davis” shortly before she married. In 1925, Lee Hersch held a solo exhibit at the Montross Gallery in New York. In the 1930s, he was painting mainly landscapes, dividing his time between California and New York. 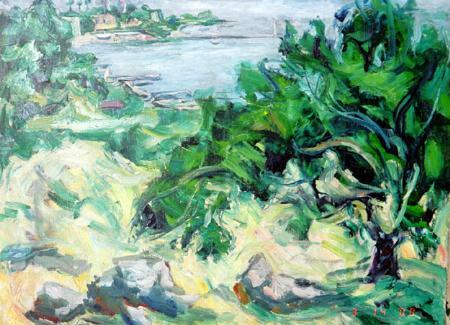 His painting of Lake Chapala is believed to date from about 1930. Relatively little is known about some parts of his life, but his works include a “super modernist impressionist painting” of Mexico’s Lake Chapala, described by the Bruce Palmer Galleries as having “great color and energy, and in fine condition”. It is thought to have been painted relatively early in his career (circa 1930) and was sold at William Doyle auction house in New York in 2005. After the second world war, his work became more abstract, and he joined the ranks of New York’s influential abstract expressionists, an art movement that rivaled or echoed what was happening in the Parisian art world. Hersch was given a one-man show by Peggy Guggenheim in her gallery in New York, which became well-known for shows of abstract expressionism, by artists such as Jackson Pollock, William Baziotes and Hans Hofmann. Hersch was a member of the Painters and Sculptors of Los Angeles and the Woodstock Art Association. He exhibited at the Pennsylvania Academy of Fine Art, Art Institute of Chicago, the Whitney Museum of American Art and the Salons of America. A retrospective of his work, with accompanying catalog, was held in Paris in 1954. Examples of his work hang in many major museum collections, including that of the Fine Arts Museums of San Francisco. Note: This is an updated version of a post first published on 22 March 2012. Albuquerque Journal, 3 February 1918, 10. Edan Hughes. Artists in California, 1786-1940. Peter Falk. Who Was Who in American Art. Bruce Palmer Galleries. “Lee Hersch”. 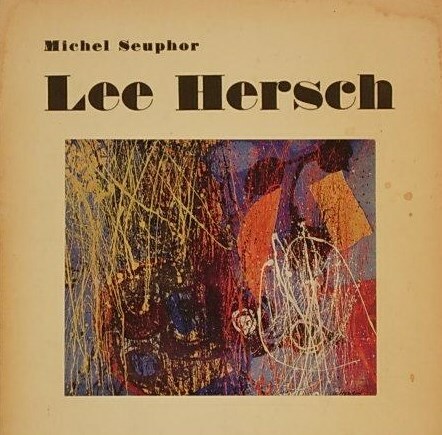 Lee Hersch and Michel Seuphor. 1954. Lee Hersch. Paris: Librairie-Galerie Arnaud, 42 pp.